June 16, 2015 09:15 ET | Source: Khalkos Exploration Inc.
MONTREAL, QUEBEC--(Marketwired - June 16, 2015) - Khalkos Exploration (TSX VENTURE:KAS) announces the signing of an option agreement on the Malartic property owned by J.A.G Mines Ltd (TSX VENTURE:JML). It is a property composed of 24 claims covering 767 hectares in the Malartic mining camp, 30 km northwest of the city of Val-d'Or. The property, which is straddled over 3 km by a gold-bearing shear zone, hosts to the Malrobic gold deposit. The agreement will allow Khalkos to position itself near important gold producers in the heart of the Cadillac deformation zone just 7 km from the Lapa mine (Agnico Eagle "AEM"), 11km from the Canadian Malartic mine (Yamana - AEM) and 20 km from the Laronde mine (AEM), as well as, on the same geological contact where the gold mines Doyon-Bousquet, Laronde and Westwood are located. On this property, previous drilling was focused only on the first 200 meters of vertical depth. The mineralized zones are still open at depth. 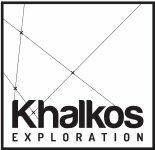 Khalkos plans to undertake in the short term, diamond drilling in order to confirm the location, the gold grade of some mineralized zones and especially their depth extensions. The first gold showings were discovered between the years of 1920's and 1930's, and led to the sinking of a shaft of80 meters with lateral development on two levels for more than 240 meters. Over 15,000 metres of diamond drilling has been undertaken in the 80's which led to the identification of six mineralized zones within the same shear. It contains a system of quartz veins and veinlets with historical gold grades ranging between 2 and 22 g/t Au over 1 to 5 metres in true thickness. The property also contains the Currie-Mills showing (Panamint) where historical grades of 19.35 g/t Au over 1.2 metres and 22.6 g/t Au over 1.5 metres were obtained approximately 1 km south of Malrobic's main deposit, also known as North-Malartic. Khalkos will obtain a 55% interest in the property in consideration of the issuance of one million shares and payment of an amount of $ 50,000 over a period of three years. In addition, a total of one million dollars in exploration work will need to be undertaken by Khalkos on the property over a period of three years including fieldwork of a value of $ 250,000 during the first year. The agreement is subject to the approbation of the regulatory authorities. This new acquisition is part of the Khalkos' mission to discover and develop high-grade gold deposits in the Abitibi.